Sigmund Kjos-Wenjum, grandfather of the present owner Ståle, in a characteristic pose at Eikum Hotel, circa 1966/67. Cars and horses were an important part of grandpa’s life, and the current dining hall previously housed stables, a barn and a garage under the same roof. The green car in the photo was his taxi, and the red car was the hotel van. Both vehicles were used to carry tourists. A third taxi would also be hired in from one of the other taxi owners in the village, either Johannes Fredheim or Olav Hillestad. The tourists were taken to the Jostedalen valley, the Sognefjellet mountain pass, the Tungestølen mountain lodge, the Heiberg Collections, Urnes Stave Church and Råadn. 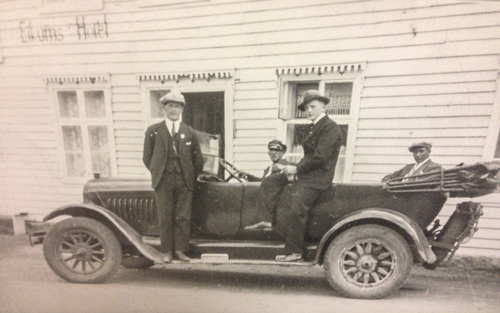 Grandpa Sigmund and dad Birger would ferry tourists to the attractions in the region every day during the summer season. Occasionally they would also make the journey to Feivall, where Mons Feivall accompanied the group to the vantage point while telling local stories. The Dutch and German tourists were left speechless with fear and wonderment. Looking at the picture, we can tell that it was taken before 1 May because grandpa is wearing a grey cap. He would always change the cover on his chauffeur’s cap to a white one on 1 May every year. He would wear the white cap until the end of the summer.